I was baffled; she explained that “Dr Oz” suggested it for sore throats. “Oh, it’s all-natural!” she asserted cheerfully. Giant mental sigh and cringe on my end; lots of “all-natural” stuff can be all-naturally poisonous. But I’m guessing the customer was assuming that if people use bizarre “all-natural” remedies, then stores would not sell as many manufactured remedies. Hey, if I want salicylic acid (the stuff in willow bark and spirea that acts as a pain-reliever, fever-reducer and anti-inflammatory), then I will buy it as acetylsalicylic acid, AKA aspirin, because that formulation is less harsh on the digestive system, and you know how much active ingredient you’re getting. When one of the pharmacists was no longer directly busy with [other] customers, I went up and told him about the customer enquiry. His eyebrows danced a bit at this latest oddity. “It bio-accumulates, doesn’t it?” I asked, and the pharmacist nodded. That of course, was why I was careful to not let any dots of the lab stuff stick to me. Plus, any clean crumbs re-deposited could be re-used, especially if I held the bottle to the vibrating vortex mixer. Note: there are antibacterial uses for various ionic silver (Ag+) compounds, such as silver nitrate (AgNO3), but the colloidal stuff is non-ionized metallic form, which has a different biological effect. Of course, poison is always in the dosage — too much silver nitrate can be equally bad. You can read about the hazards of argyria here at the Quackwatch site. Oh by the way — if you want an “all-natural” remedy for the ordinary sore throat, may I recommend some strong mint tea with honey? This was a major WTF moment when listening to the news today [transcript this link]: the Chick-fil-A chain is suing a Vermont tee shirt maker for copyright infringement. Their slogan is, “Eat Mor Chikin” and his is “Eat More Kale”. and no cows in his design. The phrase “Eat More ____” sounded vaguely familiar, and some googling around quickly showed that it has been used throughout history! 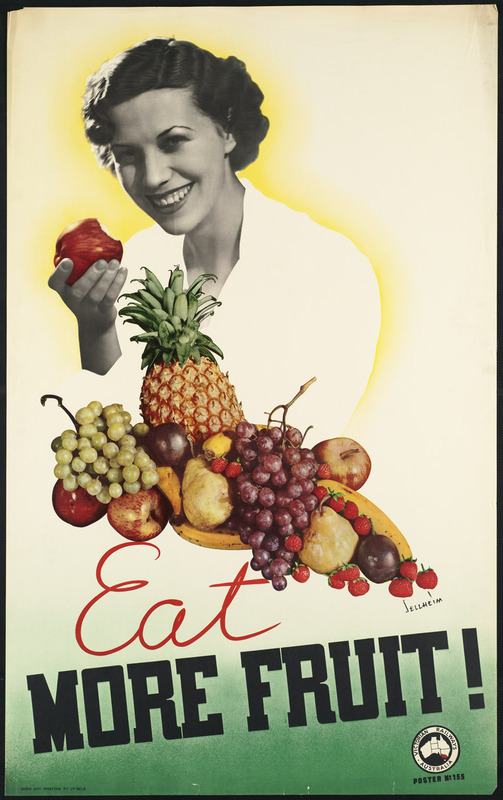 WWI Canada Food Board poster, "Eat more Vegetables! 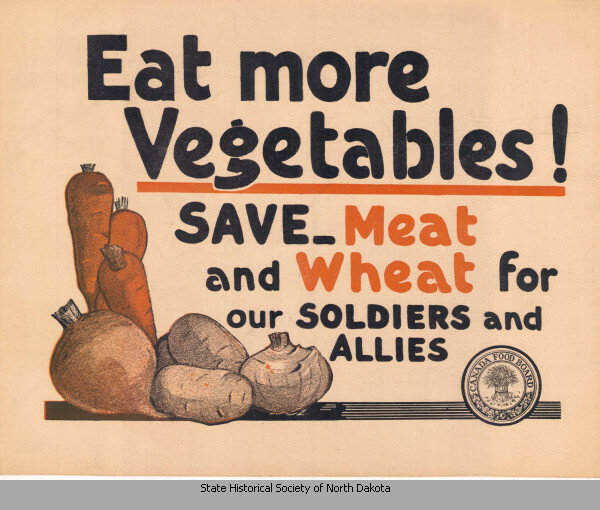 SAVE Meat and Wheat for our SOLDIERS and ALLIES"
WWI poster, U.S. Dept. 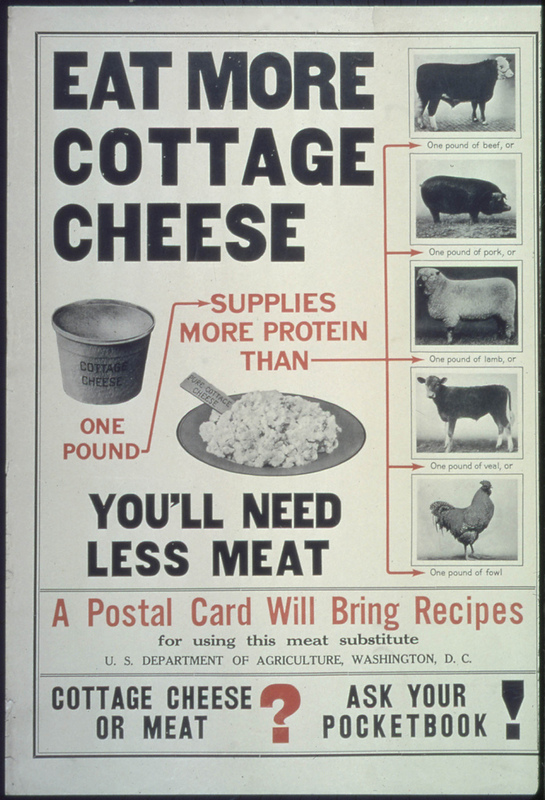 Agriculture: "Eat More Cottage Cheese...You'll Need Less Meat...A Postal Card Will Bring Recipes...Cottage Cheese or Meat? Ask Your Pocketbook!" If you do a visual google search, you can find an antique billboard on Route 66 that says, “Watch Your Curves. Eat More Beef.” from the Beef Industry Council. Apparently, in an earlier incarnation it was the Texas Beef Council, which also offered up quite an absurd pin-up girl (she’s ostensibly changing a tire, but without any cattle in the picture whatsoever). I mention these simply because they are the humorous antithesis of the “Eat Mor Chikin” cows. BTW, kale is really tasty lightly braised (PLEASE, don’t cook the hell out of it — that just makes it bitter and stringy). 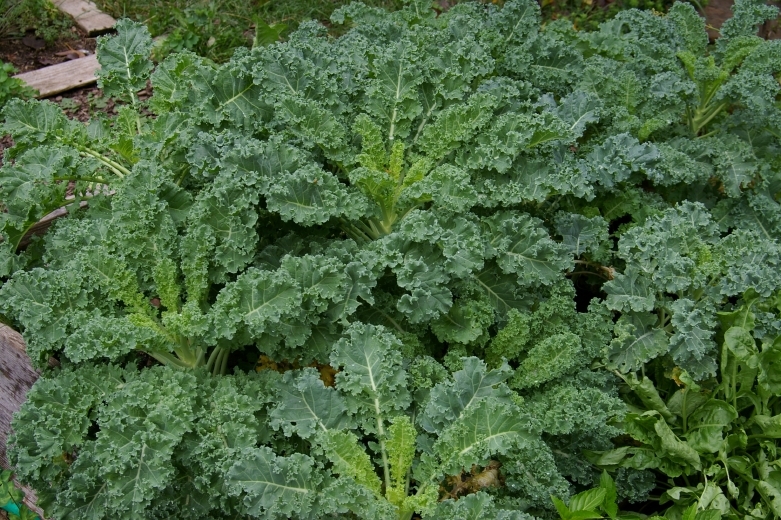 Take your gently-wilted kale and sprinkle with some balsamic vinaigrette, or chop and mix into mashed potatoes (with bacon and onions, if you like), or add bite-size pieces in soups (miso soup with udon and kale sounds REALLY good this time of year). What makes kale so great is that not only will it over-winter (meaning, you can get it from local farmer’s markets or CSA just about year-round, or else grow your own), but also that it has lots of iron, Vitamins A & C, calcium, and fiber. 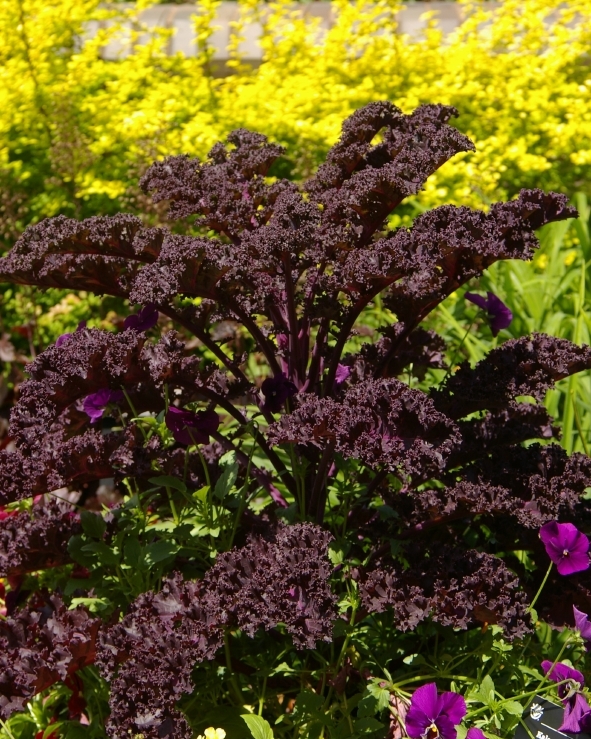 Many kales are also quite ornamental as well — not just the frilly pink sort (grown for pretty more than nutrition), but also the tall green or purple-tinged sorts, which are often used for cold-weather plants in outdoor container arrangements. Here’s a riddle: how is a broken foot like being pregnant? Mid-October I entirely missed the last two steps of the stairs to the basement floor and BLAM! Didn’t even experience the slip and fall. Hurt so much I didn’t even cuss, and only OW’d so folks would know I’d been hurt. My ankle really hurt, so I limped to my bedroom and pulled on an ankle elastic (which I keep in my purse because being hypermobile means easily spraining things). Hobbled around the rest of the day, giving it the usual Rest-Ice-Compression-Elevation between doing stuff. That was a Friday. The next day it was really swollen, with a purple bruise covering the entire upper surface, but it wasn’t horribly painful like a migraine. I called out from stocking work at the grocery, rested more, and tied on a foot brace. My son-in-law said it might be broken (it’s good to have a medic in the house). Guess what? Broken bones are not always screamingly painful. Whoda thunk? Sunday I went to the walk-in clinic, and yeup, two of my metatarsals were broken, in a displacement fracture, no less. (Meaning, the bones weren’t even lined up, but were slightly ajar.) They put on a splint. The next day I went to an orthopedist, and after due examination of the clinic’s radiographs, the doc sent me to get a boot-type cast, and make follow-up appointments. On my end, I remembered to get a ‘script for a temporary Disabled Parking permit. Whee. That was the easy part. But OMG the annoying part is not the broken foot itself. those discourteous, “well-intended”, damnably useless interactions! Because you see, when you have a physically-apparent injury, one’s body suddenly becomes part of the public’s purview; they are free to make enquiries, “do help to you”, “charmingly” engage in the social distancing of pity, and give malcommendations. It’s intrusive. Being visibly disabled [sometimes] means losing status to where anyone can ask most anything of you.I don’t mind answering questions from family, coworkers, and friends about the event and my recuperative status. But seriously, why should every random stranger feel privileged to details? Were the issue nephrological, nobody would want to know what was wrong with my bladder, or why I had to make so many bathroom trips, about the thrills of contrast dye, or what my urologist recommended. Yet like when bearing a belly bump, it’s open season. WTF? — some idjit hanging around the waiting room decided to be “helpful” and without saying anything, bounded over and suddenly yanked the door open! Mind you, I was balanced on one foot and leaning backwards against the door, so guess what?! Well, I may be clumsy (it comes with the large territory of hypermobility) but thankfully I also have lightning-fast reflexes, and was able to crash to the floor safely. (Dancers and gymnasts know whereof I speak.) That’s not helpful! And then we have the other unwanted bits of the social model of disability. Except it doesn’t sound at all like admiration at my ability to execute stunning pivots around pyramids of produce, but rather like praising a school child who had colored between the lines on a Kindergarten worksheet. And of course, it’s pitying. There is the assumption of Injury As Tragedy; they have to know when it’s going to be better. Well, what if it’s never going to get “better”? What if it’s permanent, or chronic and intermittent? It’s the sort of pity where people can’t see past the “broken” part and are uncomfortable; they’re full of Schadenfreude, relieved that the Bad Thing didn’t happen to them. Sometimes the coin of pity they pass along is a kind of magical thinking, token payment to Fate to avert similar disaster. You can tell that you’re running into the lousy end of helpers when the need for social recognition outweighs and over-rules the negative feedback from the recipients. You can tell when they lose the “take it or leave it” perspective and insist that what you need is what they have to offer. Protesting the inappropriateness of their pet form of aid is often useless; you get condescending responses about how they are “specially” qualified, and how you are being unappreciative, and cannot know what is best for you simply because you are of the recipient class. Such dread Helpers and Fixers want not just the ego-boost and recognition; they want status, and will even sometimes create their own imaginary status markers as proof of why others should recognise their special knowledge and munificent public service. At worst they are narcissistic, at best, merely clueless. One of the oddest things I have run into with such types is not just the insistence that their pet solution is what is needed, but that any solution they have heard of should be helpful and tried. The advice is coming from them and they want what’s best for you, therefor it’s automatically good advice. I have at times been left so amazed that someone could suggest doing something so far off base with my needs, so profoundly inappropriate, that I was all but sputtering. It wasn’t just an off-target bit of advice, an unhelpful recommendation. It was, I decided later, a malcommendation, a bad recommendation (usually inadvertent) but still bad advice nonetheless. “No no — I know all about that,” she asserted, her smugness wafting over in a perfumed cloud. Look, as a medical assistant or what-have-you, you don’t know “all about that”; it’s obvious that the doctors know LOTS more. Secondly, you’re presuming that you know what is best to do TO me, or to do FOR me. Apparently you’ve not realised that I don’t want to be a passive recipient of your “expertise”. Seriously, when doctors-medics-aides-ancillary-healthcare-professionals know things I don’t know, that’s great! That’s why I’m here visiting your officies. But please, presume some self-awareness of my actual needs, and competency on my part. Work WITH me. I can haz civil liberties? 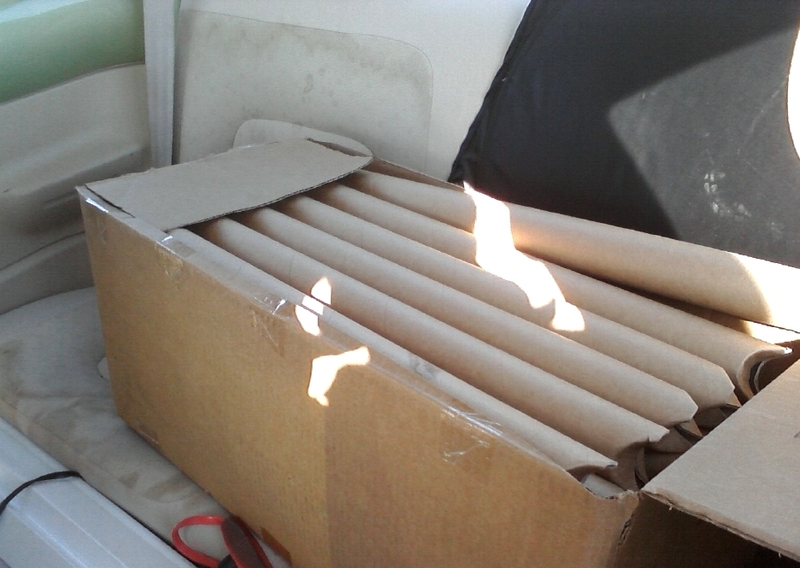 Just the other week, I finally got around to mailing an envelope off to Locks of Love, non-profit that makes wigs for children who have long-term hair loss for medical reasons. My son’s not keen on haircuts, so for a long time, he didn’t bother. By the time he finally got around to getting to the salon, his hair reached to his shoulder blades. Because it was “virgin hair” (never died or permed), the pony tail cut off was perfect for making into such a wig. At least he didn’t get kicked out of school, unlike four-year old Taylor Pugh. That lad is also growing out his hair for donation (whether to Locks of Love, or another organization). But the preschooler goes to school in the Mesquite Independent School District, near Dallas, Texas. Taylor has been suspended for having too-long hair, and spends his days in the library, with a teacher’s aide. Seriously. In trouble for hair-length that was perfectly acceptable for the country’s founding fathers. Hair that has a social benefit for donation. But then, this school district has some pretty stringent dress policies. Why, even your shoe laces have to be the correct color, and your socks had better match. Only certain colors of slacks are permitted, and they’d better not be the same color as your shirt. Corduroy pants aren’t acceptable, either. Black and white photograph of Dr Martin Luther King, Jr, with the caption, "DR. KING He didn't lead a major civil rights struggle and get assassinated for you to walk around with your pants around your knees." Getting there … or, Not. The other day, my daughter sent me a link to this post by Xenakis, which describes the wonderful side of Universal Design. In other words, build something right from the start, and you won’t have to go back and tack on ugly access structures. There are a few problems I can see with this approach. One is that it might be too easy for a wheelie to get off-ramp — perhaps there are guiding impediments that I can’t see in the image. Also, someone commenting on Xenakis’ post, points out that people who walk up ramps often need hand rails, and the rails are only along the stairs. Personally, I would also like to see some kind of contrast striping between the stairs and the ramps; can you imagine going up or down this in a rainy, dark night? Nonetheless, it’s still a really cool advancement over the traditional Deep Flight of Stairs Up to an Official Building. And last but not least (just for grins), Teh Dumb from a hospital somewhere. I’m not fond of MRI machines from the comfort perspective, for all they can make great pictures. The last time I was in one, I wore ear plugs and they gave me the clam-shell headphones to help block out some of the noise. But I have hyperacussis and tinnitus, and 45 minutes later my head was ringing so badly, I slithered off the padded bench and crumpled to the floor.